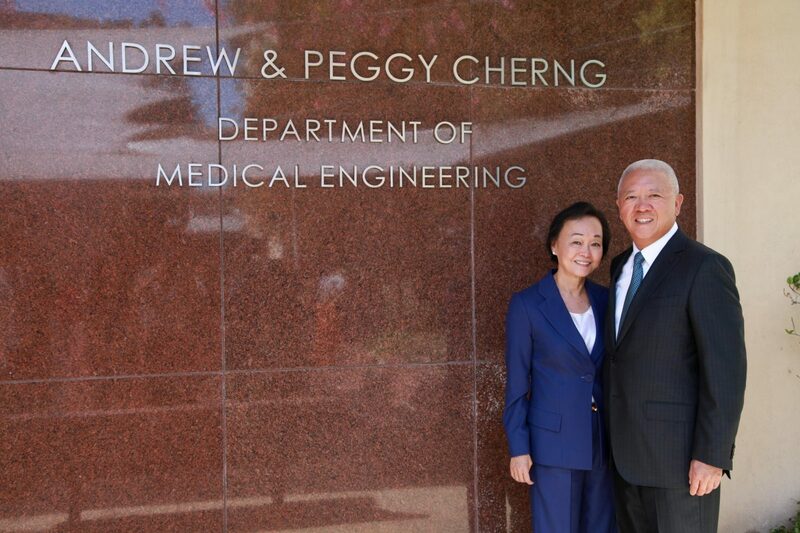 Caltech celebrates the dedication of the Andrew and Peggy Cherng Department of Medical Engineering. 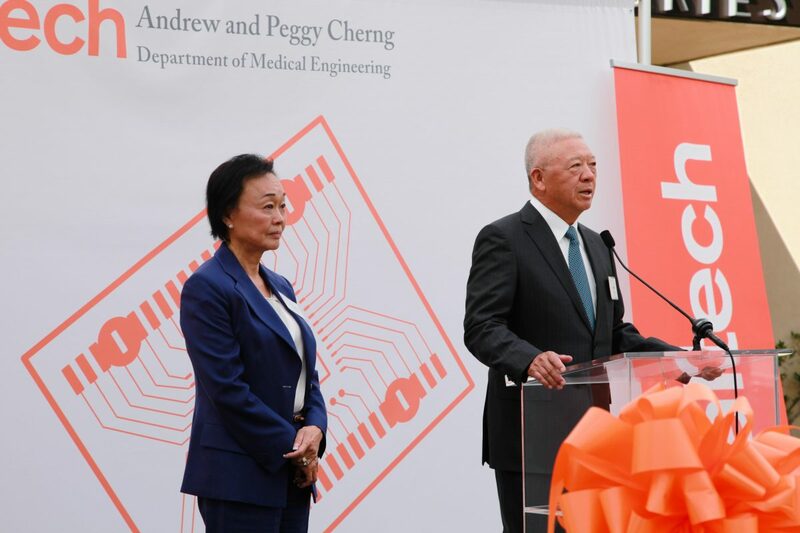 On Tuesday, September 26, the Caltech community formally dedicated the Andrew and Peggy Cherng Department of Medical Engineering with a series of campus events. Thanks to a $30 million gift from the Cherngs, founders of Panda Express, this is the first endowed department at Caltech. The day’s activities included tours of medical engineering labs for friends, colleagues, and family members of the Cherngs. 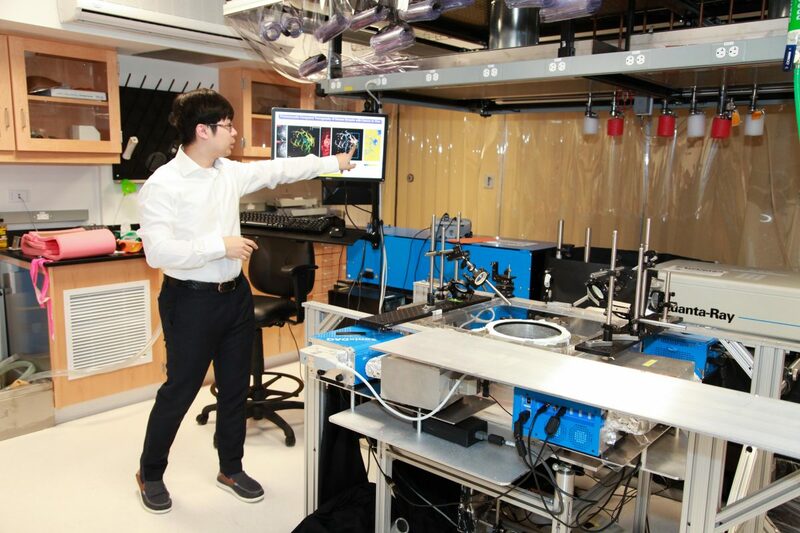 As part of the tour, Caltech graduate student Lei Li showed off the lab of Lihong Wang, Bren Professor of Medical Engineering and Electrical Engineering. Wang’s team is working on better ways to see inside the body, for use in medical screening, diagnosis, disease monitoring, surgical guidance, and other healthcare procedures. At the formal dedication ceremony, Andrew and Peggy Cherng spoke about their business roots in Pasadena and the people who introduced them to Caltech, about the shared mission of the Panda Group and Caltech to innovate in ways that improve lives, and about the importance of giving back to the communities that support you. A ribbon-cutting capped the public dedication of the Andrew and Peggy Cherng Department of Medical Engineering. 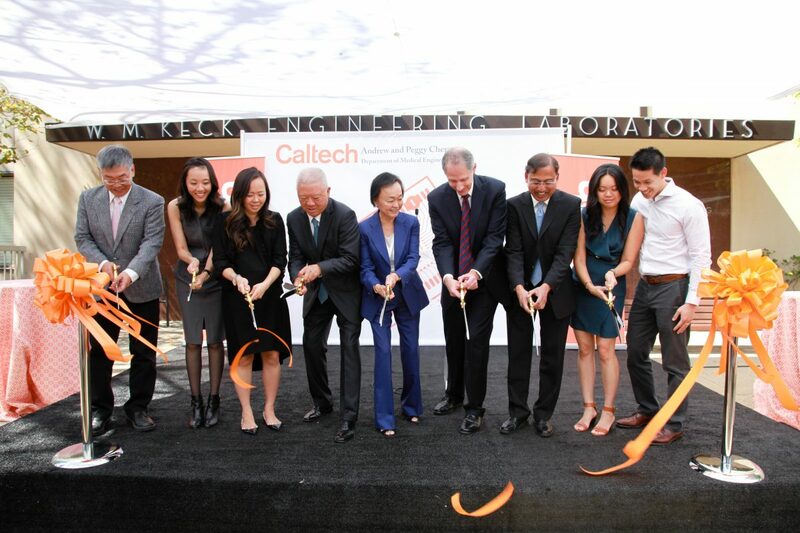 Participating in the ribbon-cutting were (from left): Yu-Chong Tai, holder of the Andrew and Peggy Cherng Medical Engineering Leadership Chair; Andrea Cherng; Nicole Cherng; Andrew Cherng; Peggy Cherng; Caltech President Thomas F. Rosenbaum; Ravichandran; Michelle Cherng; and Ben Lee. 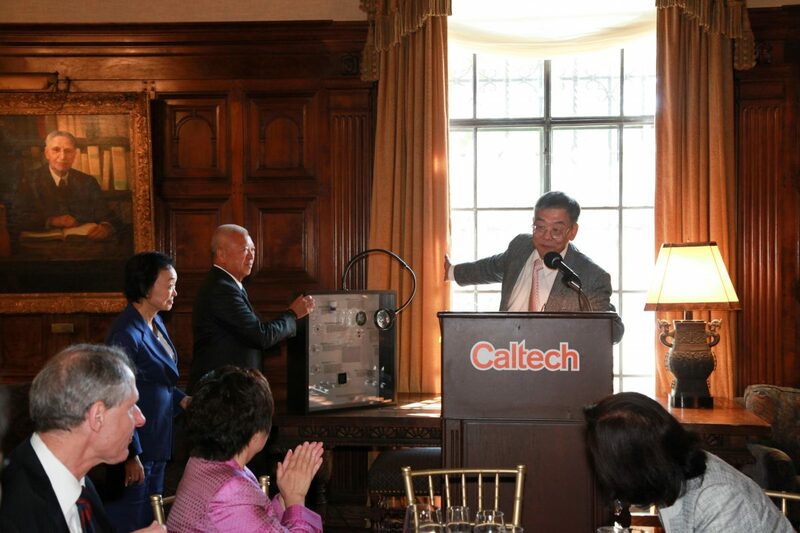 At a private lunch in Caltech’s Athenaeum honoring the Cherng family and their guests, Yu-Chong Tai (at podium)—holder of the Andrew and Peggy Cherng Medical Engineering Leadership Chair, Anna L. Rosen Professor of Electrical Engineering and Mechanical Engineering, and executive officer for medical engineering—presented Andrew and Peggy Cherng with several gifts. Among them was a display featuring tiny devices invented by Caltech faculty that could revolutionize healthcare. 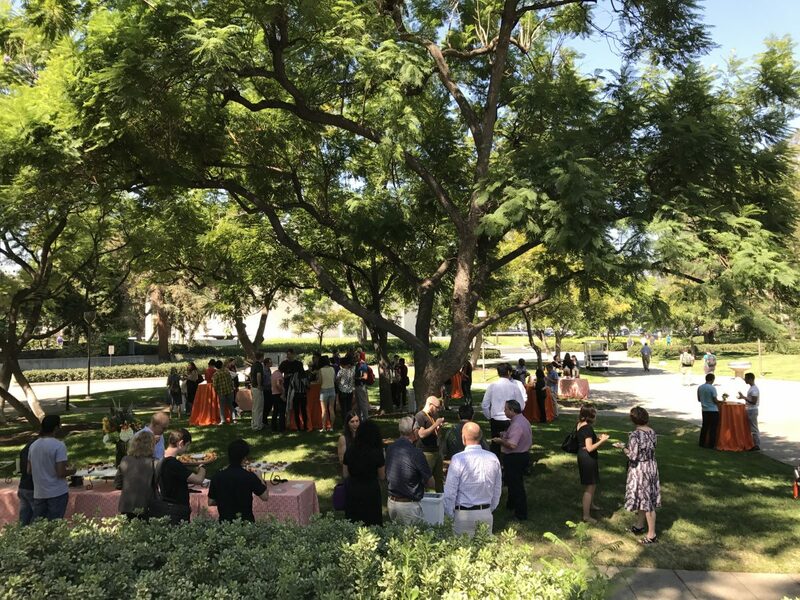 The campus community feted the newly dedicated department with sweet treats and drinks under a canopy of trees on the north side of the W. M. Keck Engineering Laboratories, the official campus home of Caltech’s Andrew and Peggy Cherng Department of Medical Engineering.